From Lawrence Berkeley National Laboratory comes the announcement that researchers with the U.S Department of Energy (DOE)’s Joint BioEnergy Institute (JBEI) have identified a potential new advanced biofuel that could replace today’s standard fuel for diesel engines. It would be clean, green, renewable and produced in the U.S.
JBEI research team used synthetic biology tools to engineer strains of two microbes, a bacteria and yeast, to produce a precursor to bisabolane, a member of the terpene class of chemical compounds that are found in plants and used in fragrances and flavorings. Preliminary tests by the team showed that bisabolane’s properties make it a promising biosynthetic alternative to No. 2 diesel fuel. Researchers at JBEI are pursuing the fundamental science needed to make production of advanced biofuels cost-effective on a national scale. One of the avenues being explored is sesquiterpenes, terpene compounds that contain 15 carbon atoms (diesel fuel typically contains 10 to 24 carbon atoms). 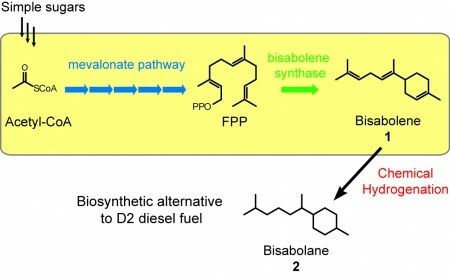 Path to Make Bisabolane as Diesel Altenative. Click image for more info. The team’s paper about the research has been published in the journal Nature Communications entitled “Identification and microbial production of a terpene-based advanced biofuel.” Lee the corresponding author is joined with Pamela Peralta-Yahya, the lead author of the paper and Mario Ouellet, Rossana Chan, Aindrila Mukhopadhyay and Jay Keasling. The hunt is very much on for alternatives to fossil based fuels. Advanced biofuels for liquid transportation fuels derived from the cellulosic biomass of perennial grasses and other non-food plants, as well as from agricultural waste are highly touted for their potential to replace gasoline, diesel and jet fuels. In earlier work Lee and the team engineered a new metabolic reaction critical to biosynthesis (also called mevalonate pathway) in both E. coli and S. cerevisiae that resulted in these two microorganisms over-producing a chemical compound called farnesyl diphosphate (FPP), which can be treated with enzymes to synthesize a desired terpene. In the latest work, Lee’s team used that mevalonate pathway to create bisabolene, which is a precursor to bisabolane. When they began the work, the team did not know whether bisabolane could be used as a biofuel, but they targeted it on the basis of its chemical structure. Their first step was to perform fuel property tests on commercially available bisabolene, which comes as part of a mixture of compounds. Convinced they were onto something, the researchers then used biosynthesis to extract pure biosynthetic bisabolene from microbial cultures for hydrogenation into bisabolane. Subsequent fuel property tests on the bisabolane were again promising. “Once the complete fuel properties of hydrogenated biosynthetic bisabolene can be obtained, we’ll be able to do an economic analysis that takes into consideration production variables such as the cost and type of feedstock, biomass depolymerization method, and the microbial yield of biofuel. We will also be able to estimate the impact of byproducts present in the hydrogenated commercial bisabolene, such as farnesane and aromatized bisabolene. Lee said. Lee and his colleagues would like to replace the chemical processing step of bisabolene hydrogenation with an alkene reductase enzyme engineered into the E.coli and yeast so that all of the chemistry is performed within the microbes. The JBEI project looks good, even as a two step process. It looks like the raw material would be sugar – a product of intense interest as noted yesterday. If the cheap sugar matter is resolved with a bit of competition, projects like this have a good shot at getting to market. I’d like to hear how much energy is used to heat the water,etc . That would tell us if this is interesting or not. Very interesting, and directly relevant to the recent news about industrial scale sugars from cellulose. takchess: The researchers are aiming to produce this D2 substitute using bacteria — like many pharmaceutical products are produced. If successful, energy costs should be minimal. The JBEI team and associated bioenergy startups in the East Bay are doing some impressive work. I admit to being pleasantly surprised. I am always fascinated by articles like this – it is good to know that there is work being done out there to find replacement to conventional fuels that are more ‘green’ and less damaging to our environment.